ECE2018, the 2018 edition of the European Congress of Entomology will take place in Naples, 2-6 July 2018. More information on ECE2018 website. There will be an IAGC Workshop at Entomology 2017 which will take place in Denver on November 8th 2017. See the full program on the official website. 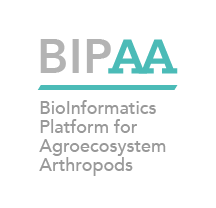 Most of BIPAA web services (including Apollo servers) will be unavailable on August 10 morning (France time) for a scheduled maintenance (system upgrade and performance improvements). Galaxy and Blast jobs will not be impacted by this maintenance. We are experiencing problem on one of our storage system, as a result, our web services are currently degraded. We are working hard to bring everything back online. Sorry for the inconvenience. If you are involved in the annotation of new genomes using Apollo, we have just made available up-to-date guidelines to help you in the curation process. These guidelines will be used during the March 22nd and 31st webinars. Due to a general shutdown of the electrical installations of Irisa/Inria, the entire GenOuest and BIPAA infrastructure will be stopped on 24 March afternoon with a progressive restart scheduled on 27 March.